Working out the kinks in regular season games with just 6 days of practice and no pre-season has created a bubble industry for special teams early in the 2012-13 season. As the second week draws to a close, players and referees alike have been undisciplined, generating a surge in power plays with poor penalty killing to match. As a result, half the NHL has a PK rate below 80% with teams averaging 4.40 PPs per game. By comparison, last year ended with just 6 teams under 80% averaging 3.31 PPs per game. So for now, the higher volume of chances, combined with higher success rates has pushed special teams back into the spotlight. The good news is that PPs per game were over 4.80 the 1st week of the season so the return to norm is already underway. For the Habs, their 78.1% PK is good enough for 19th in the NHL and as usual in recent years, a lack of discipline is undermining their chances to win hockey games. The 7 power play goals against the first 6 games makes a bit more sense when you consider only 2 teams racked up more penalty minutes. Yes it’s early but the Canadiens spent the most time killing penalties the last 2 years so this is very familiar territory for them and a major challenge for Michel Therrien going forward. With half the league struggling on special teams, there’s still time for the Habs to get theirs dialed in and with only 22% of total offence coming from power plays last year, there are bigger concerns elsewhere. Plekanec (3:45 avg) and Moen (3:03 avg) are the 1st pair of PK forwards yet again and out of the 7 power play goals against, Plekanec has been on the ice for 2, Moen for 1 in 5v4 play. Both were on for a 5v3 goal against. Given their track record and early season results, there’s no cause for alarm here. Armstrong (2:46 avg) and Prust (2:40 avg) are currently the 2nd PK pair. Armdog has been on for 2 goals against, Prust for 1 in 5v4 play. Not too bad for a pair that’s never played together and an excellent example of Bergevin and Therrien wanting players, especially depth players, who aren’t one trick ponies. White (1), Gionta (2), Bourque (0) and Eller (0) have been mixed and matched on the PK and I like that Gionta is getting less PK work in a compressed season. Ryan White should be getting more PK time on the 2nd unit but you can’t kill off your own penalties. Eller is a good penalty killer but will be limited while he remains in Therrien’s doghouse. I’m not overly concerned about Eller just yet but he’s far more comfortable at C than LW. Eventually, Eller should settle in on the 2nd PK unit as he did with success last season. Fourth line depth with guys capable of doing more is for me, the major improvement over last season. I can’t imagine what the Habs PK would look like if Prust and Armstrong weren’t here. I loved the Prust signing this past summer because he’s much more than a scrapper and so far, he’s delivered as expected. That said, Armstrong is simply a one year stop-gap. As for the PK defense pairings, Gorges (4:13 avg) and Bouillon (4:11 avg) have been the 1st set with Soup keeping a seat warm for P.K. Subban’s imminent return, at which point the 37 year old will slip back into a supporting role. Both have given up 3 goals against 5v4. The 2nd pair is Emelin (4:01 avg) and Markov (3:47), which is pretty much a lock at even strength as well. Emelin has been on for 4 goals against 5v4, Markov for 3. Emelin still leads the NHL in hits and finally took his 1st penalty of the season last night in Ottawa. Of all things, a minor for holding. The Habs currently sit 5th in power play opportunities, averaging 5.5 per game which is way above their 3.67 average last season. That will surely come back to earth, as will their 8th ranked 27.3% success rate but only time will tell if the new system, players and demand for discipline will finally fetch them surplus power play minutes. Pundits tend to focus on power play opportunities and hey, Columbus and Montreal got the 2nd and 3rd most PPs last year yet both were in the draft lottery. For the Habs to maximize the power play, they have to play more disciplined and stop taking bad penalties. Now. Thank the hockey gods for Tomas Plekanec (PP: 3G, 1A) having a healthy Brian Gionta (PP: 1G) and a reinvested Rene Bourque (PP: 1G, 1A) to work with in the early going because David Desharnais, the Habs 1st line center and 1st line center on the power play last year has been brutal. DD’s production consists of just 2 secondary assists, both on the power play and is already -3, worst among the Habs forwards. Desharnais will get every opportunity, and then some, to turn it around while everyone around him gets blamed. Erik Cole certainly looks like he spent too much time sewing “Puck Bettman” caps during the lockout with just 1 secondary assist on the power play through the first 6 games but has the rack record to suggest it's temporary. Max Pacioretty is a couple weeks away, thanks to Adamantium but was off to a good start on the power play, assisting on 3 of the 4 PP goals scored by Andrei Markov. While Michel Therrien plays musical chairs in the attempt to get Desharnais and Cole going, some of their ice time (PP and ES) is going to Galchenyuk, Gallagher and Prust. Not a bad thing on home ice where you can pick your spots but a dangerous game to play on the road. Neither Chuckie or Gally have a power play point but that’s not a long term concern. Until then, the Habs need Desharnais, Cole and a healthy Pacioretty to get back on track quickly and start carrying the Habs mail. It’s been entertaining to see and hear the needless tire pumping on Andrei Markov. Few who follow the Montreal Canadiens doubt Markov’s abilities, they doubt his ability to stay healthy and most projections are based on that doubt. Markov lost a step and some mobility with the latest knee surgery but so far, he’s done an excellent job anticipating the play to minimize it. Markov’s vision, outlet passes, command on the ice and shot accuracy are all still there however but until he plays a healthy season, most sentences involving Markov will contain an IF. All 8 of Markov’s points (4G, 4A) have come on the power play with only 1 secondary assist and the biggest beneficiary of Markov’s play so far has been Raphael Diaz. Of his 8 points, 6 are secondary assists and Markov has been on the ice with him for 6 of the 8. Diaz has done an excellent job subbing for P.K. Subban on the power play but he’s certainly no long term replacement for him. Diaz will push Kaberle even further down the depth chart while making $3 million less, making Kaberle the leading buyout candidate this summer. If the Habs hope to go back to the playoffs, it starts and ends with how well Desharnais, Pacioretty and Cole play at even strength on the road. Last season with cherry minutes and line matching at home, the DD line was a collective +48, excluding empty net goals against. 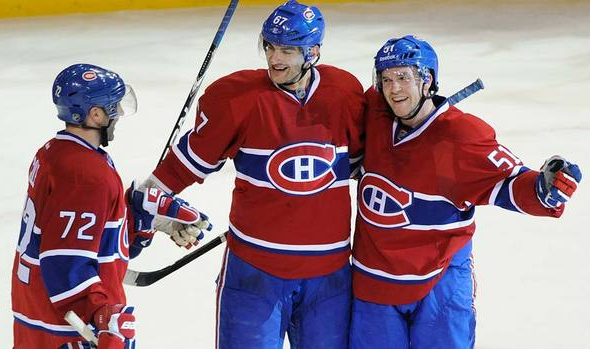 If all 82 games were on home ice last season, Pacioretty would have racked up 84 points, Cole 72 and Desharnais 70. That’s 1st line performance, no question. Unfortunately, it was a very different story on the road. Without last change, they were a collective -11, excluding empty nets goals against. Pro-rated, they all slumped with Desharnais becoming the equivalent of a 51 point player while Pacioretty and Cole performed like 50 point players. That’s a 33% drop in production on the road and that's nowhere near good enough. The Habs cannot have a top line that can be dominated on the road and the home stats have done an excellent job concealing the greater problem. I’ve had difficulty finding anything to suggest this is the fault of Pacioretty and Cole becoming shrinking violets on the road. The main reason for the drop in production is that David Desharnais has difficulty being a playmaker on the road in power on power match-ups. He relies on his wingers to get the puck through the neutral zone and heads towards the net while Patch & Cole hound the puck. For a playmaking center on the rush, the puck is rarely on his stick as they cross the red line and as a result, the line loses control of the middle when trying to enter the offensive zone. If the Habs are to improve their even strength goal differential on the road, the DD line must improve dramatically and so far this season, Desharnais, Pacioretty and Cole have combined for 2 even strength points (1G, 1A) in 15 games. The road worries are the reason I question Desharnais as a long term solution at 1C. The primary beneficiaries of the DD line getting some of their TOI cut in the early going has been Galchenyuk (1G, 4A), Gallagher (2G, 2A) and Prust (1G, 1A). At home, with managed minutes and good match-ups they've done really well but don’t expect that on the road just yet. All the power plays early in the season have masked the fact that this team still has a lot of work to do to improve at even strength. The line of Plekanec (1G), Gionta (1G, 1A) and Bourque (1G) have combined for just 4 even strength points in 18 games so once the power play bubble bursts, the real question of how improved the Habs are at even strength will start to be answered, as will their chances of making the playoffs. I expect Carey Price to play at least 42 games and among goalies with at least 4 games, Price ranks 9th in SA% and 8th in GAA. If he can maintain those numbers, the Habs will be content. Barring injury, he should be a top 10 goalie in the NHL this season. Marc Bergevin became GM of the Montreal Canadiens on May 2nd, 2012 and made his first trade on January 14th, 2013, a minor deal sending Brendon Nash to Florida for Jason DeSantis. Needless to say, the jury is still out on how good a horse trader he'll be or how protective he'll be of high draft picks, starting with the 4 draft picks coming in the first 2 rounds this summer. His first major trades will be strong indicators if this really is a new era of a professionally run hockey club with a long view or more of the same, where 6-8th place is considered a good year and worth losing young assets reaching for that lowered bar. Sending Gomez home was the right move and Tomas Kaberle will surely follow him out of Montreal this summer, sooner if at all possible. As a contract negotiator, Bergevin is frugal which fits the Canadiens M.O. rather nicely but I’m concerned the short term savings on P.K. Subban when there was cap available will ultimately cost the team a lot more money and cap space down the line, when the cap will be in lock-step to move higher. Michel Therrien came to Montreal, supposedly a changed man but only time will tell if he truly shed the well-deserved reputation as a short-tempered coach, unafraid to publicly embarrass his players in the media. I really hope the Habs are able to play “on their toes” more with a stronger forecheck because that’s not how he ran that highly-skilled team in Pittsburgh. When Dan Bylsma replaced Therrien, one of the first statements made was that he wanted the Pens to play more up-tempo and utilize all aspects of the player’s skills. That’s probably a standard response given by all new coaches but Dan Bylsma made it happen, just as Ken Hitchcock did when he took over in St. Louis. Michel Therrien? Only time will tell. So far, Therrien has been spending a lot of time asserting himself, demanding more discipline and pushing the team concept. Lars Eller was 1st in his doghouse and Ryan White was right behind him. David Desharnais has had his ice time cut as he tries to get on track and it looks like Therrien would put a shock collar on P.K. Subban if he could get away with. And P.K. hasn't even played yet. The John Tortorella approach only works in winning environments so Michel Therrien can’t fall into bad habits as he learns how much carrot and stick each player requires to perform their best. With a 4 and 2 start, Therrien's been calm and has done a good job handling Galchenyuk and Gallagher When the team struggles, and they will, we'll see just how much of a changed man Michel Therrien really is.